Early 20th-century postcard. 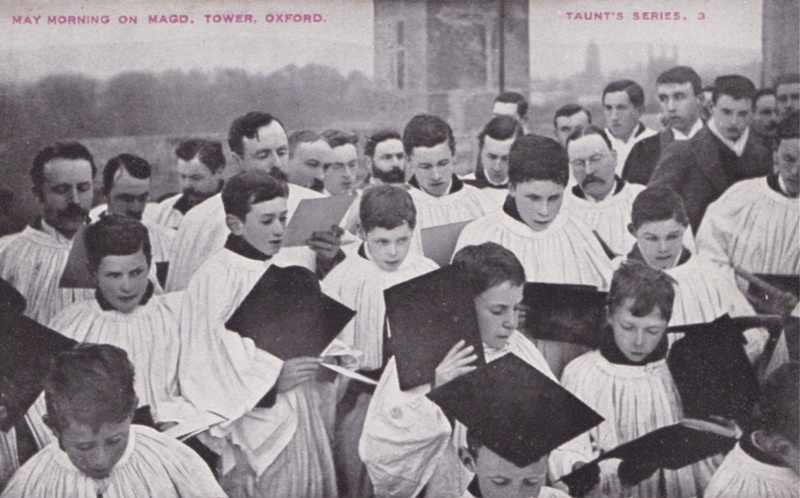 By now the May Morning choir on Magdalen Tower was iconic of Oxford. When did custom of singing from Magdalen College Tower begin? The most widely accepted theory is that it started in 1509 when the building of the Tower was completed. Henry VII, a benefactor of the college, died on April 21st the same year and there may have been a commemorative element too. If the custom does date from 1509, the vocal music will not have been the Hymnus Eucharistus. This was not written until the 1670s when the lyrics were penned by Dr Thomas Smith (Fellow 1665-92) and set to music by Benjamin Rogers (Organist 1664-1686). The Hymnus Eucharistus became the college ‘Grace’. Almost two hours! The mid 18th-century ceremony still began at 4 o’clock in the morning, as it did in Wood’s day. At some time in the latter half of the century, the business of mounting so long a concert of merry catches so early, in what is often horribly cold, drizzly weather, became too much of an ordeal. According to Dr Routh, President of Magdalen between 1791 and 1854, one wet May morning, organist and choir climbed the 172 steps to the Great Tower and just sang the Hymnus Eucharistus. It was mercifully short, and as the college Grace, needed no rehearsal. (For the Latin text and an English translation, click on Hymnus Lyrics above). Dr Bloxam restored decorum by insisting that the choir should wear their surplices, take off their hats and caps when the hymn commenced, and turn East towards the sun which usually rose at just that time. The rehabilitated ceremony now started to attract greater interest from town and gown alike. 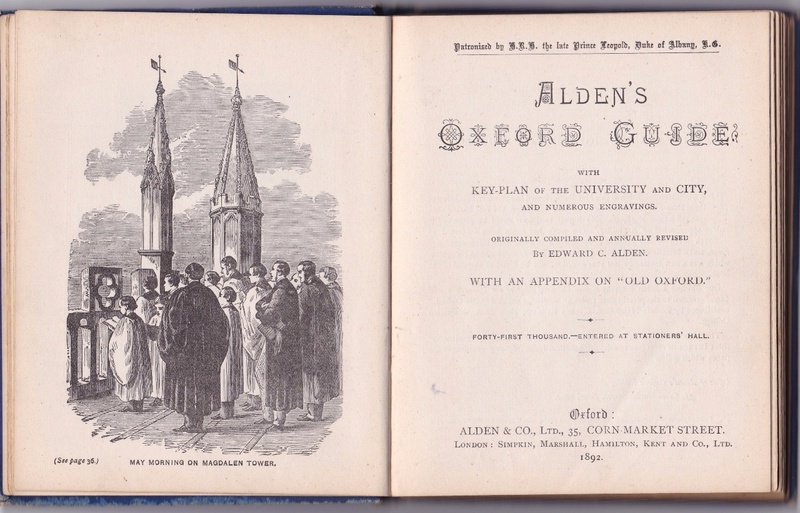 By 1869 it was a noted feature of the Oxford calendar, with 200 people on the tower. In 1888, the Pre-Raphaelite artist Holman Hunt attended the ceremony. His May Morning on Magdalen Tower, would bring the custom to national attention. Hunt started work on the painting in 1889, using for his figures Fellows from Magdalen College, including Bloxam himself (the man with the black robe in the painting). Hunt imagined the ceremony of greeting of the sun on May morning from a high place to derive from Druid rites. The artist also believed the custom ‘testifies to a latent but strong racial poetic feeling in the English nature’ Daringly, he included a Parsee in the assembly, modelled on a merchant from the recently opened Indian Institute in Oxford. Parsees, like other Zoroastrians, revere the sun as a source of light. Hunt’s painting carried a pan-human message, connecting Christian with pre-Christian and non-Christian traditions to suggest that all religions serve a common spirituality. It was Holman Hunt’s painting which really made the service on MagdalenTower an iconic image of Oxford. 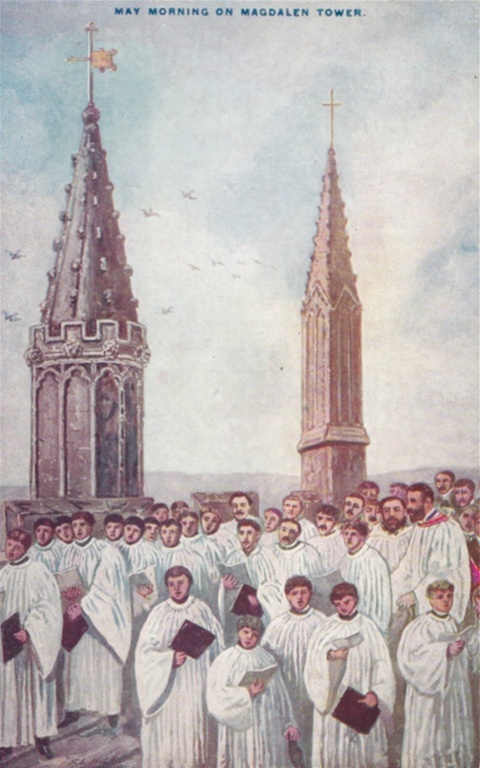 In 1892 an engraving of the choir appeared at the frontispiece of Alden’s Oxford Guide; and postcards would later be issued illustrating the same theme. 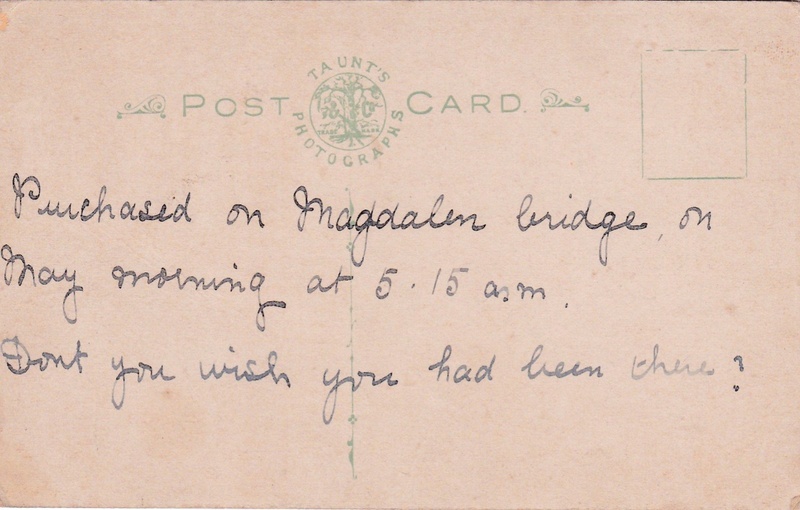 Henry Taunt postcard shows May Morning on Magdalen Bridge. 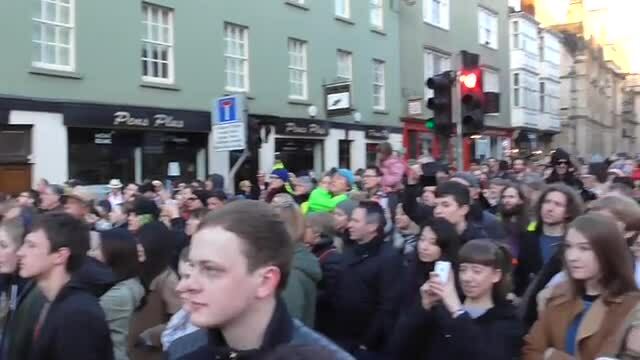 The reverse suggests that vendors were out in the early hours selling postcards to the crowd (see below). 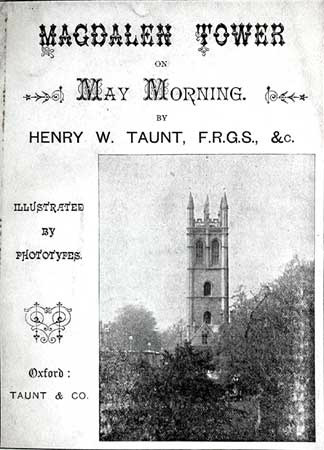 Victorian photographer Henry Taunt (1842-22) produced many images of May Morning in Oxford, and the early years of the 20th century are described by Phyl Surman in her ‘Pride of the Morning – An Oxford Childhood’. 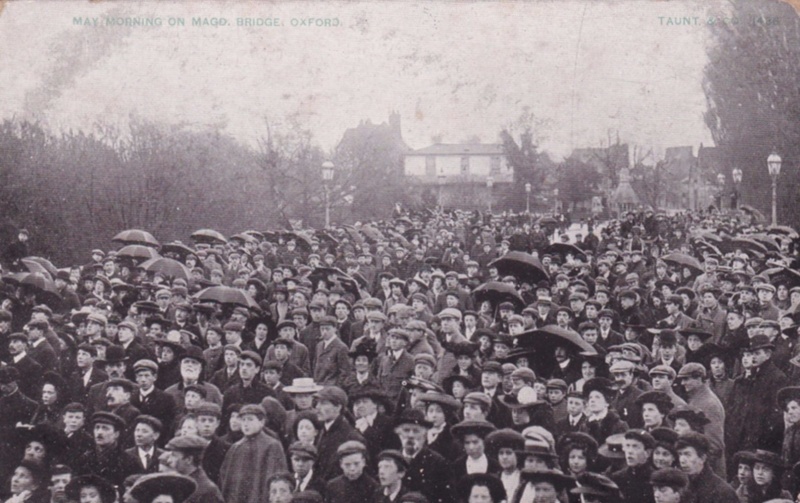 She recalls that in the 1920s horns were still being blown on May Day and Magdalen Bridge was garlanded by youngsters. ‘The younger children, wearing flower-decorated hats came with hoops and staves, gaily decorated with wild flowers: primroses, cowslips, bluebells; and sitting against the parapet of the bridge displayed these works of floral art for all too see, inviting expressions of appreciation in a flower-bedecked collecting box’. Colourful as the scenes were in the early 20th century, the sheer numbers crowding the bridge have soared since. Up to the end of World War Two a couple of thousand people might be expected to turn up. In 1968 the number was 5000, and in 1974, 10,000. 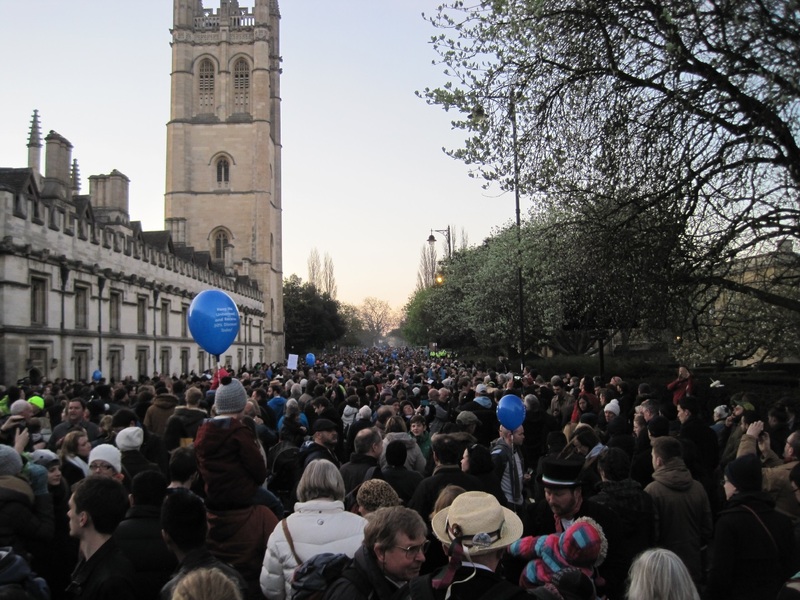 From 1978, when May Day became a bank holiday, there was a further surge in interest so that by 2011 The Oxford Mail was reporting 18,000 people gathering to hear the choir sing at 6am. In 2017, with May Day falling on a Bank Holiday Monday, the numbers were higher still - 27,000 were present. Though undergraduates once leapt from punt to punt, the notorious practice of jumping from the bridge is believed to have started rather later. Youngsters were jumping occasionally in the 1940s and 1950s, but news coverage - and controversy - seems to date from the 1980s. In 2005 the bridge was closed to the public after 40 people were hurt plunging into the water. Three years later it was re-opened. Then it was closed again. 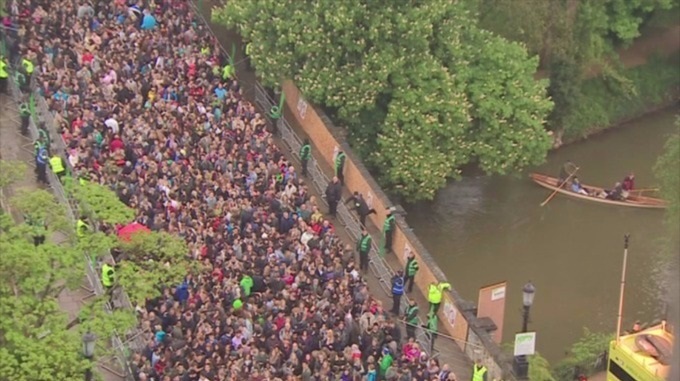 Magdalen Bridge was re-opened in 2011 and crowd safety has since been successfully managed by the authorities. For some years the Hymnus Eucharistus has been followed by a singing of Thomas Morley's 'Now is the Month of Maying' - a part song first published in 1595. Entirely secular, the jaunty celebration of springtime frolics includes a saucy double entendre in its last lines: 'Say, dainty nymphs, and speak/Shall we play barley break?' (Barley-break is effectively a 'roll in the hay'). For the full lyrics and a brief video click on The Month of Maying above. 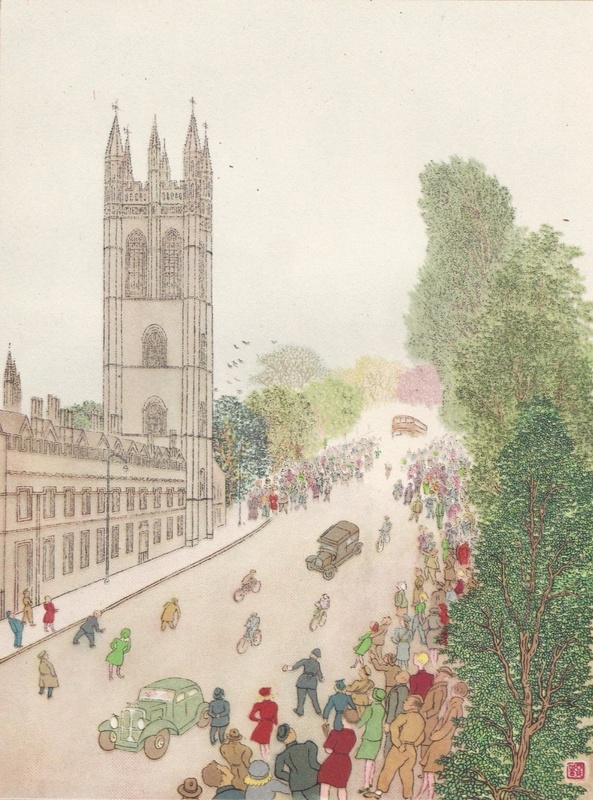 'May Day Service on Magdalen Tower' from Chiang Yee's 'The Silent Traveller in Oxford' (1944). Wartime brought sparse attendance, and there was clearly no road closure at this time.